This Monarch Specialties writing desk will be a stunning focal point in your contemporary home office. Accented with a white finish, this piece is design with thick panels and stylish lines that go with a variety of decor. Constructed from sturdy manufactured wood, this piece keeps your work space well supported. Keep it compact and organized with this desk, and still have enough room to store a computer, notebooks, and more. Desk Type: This writing desk is perfect for any office or workspace, providing plenty of surface space to write and work on. The Carpina Ladder Desk is not just a desk! With 2 Floating Ladder Shelves and an internal cubby space, the Sobral completes all your needs for a home office. Shelves are secured to the wall and are perfect for books, picture frames and collectables. Made of high quality MDP with beautiful color options. Perfect fit for your home office, kid's room and bedroom. Seven flush-panel drawers are the main attraction of this highly functional desk, providing plenty of storage for all your essential files, documents, accessories and study materials. The working surface is very generous and the in-set legs are a reflection of intelligent, chic design. Available in dark cherry. No matter what you work on next, be sure you have plenty of space with this writing desk from Home Styles. Colored in a beautiful white shade, this piece brings a touch of flair to any room. The solid wood material will offer sturdy and reliable support for years to come. Its compact design includes all the space you need for a well-organized workspace, giving you room for a computer, notebooks, and more. Designed in modern style and durability, this Nexera writing desk is a perfect addition to any contemporary office. 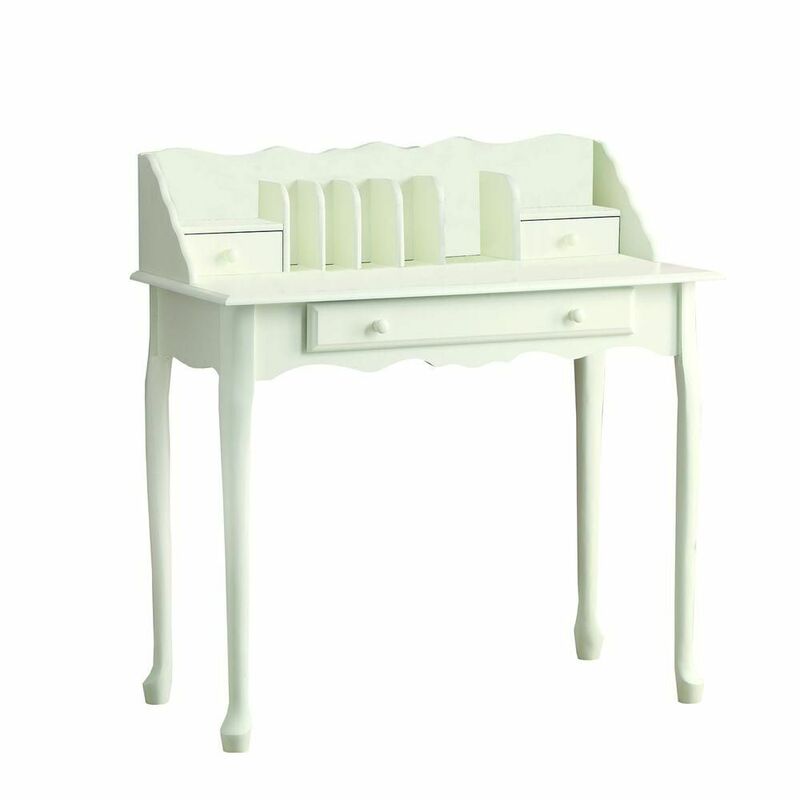 Its stylish white finish brings a touch of flair to any room or office. Its sturdy solid wood frame provides your work space with support and lasting durability. Keep your workspace tidy and compact with this desk. 36-inch x 38-inch x 18-inch Standard Writing Desk in White This Monarch Specialties writing desk will be a stunning focal point in your contemporary home office. Accented with a white finish, this piece is design with thick panels and stylish lines that go with a variety of decor. Constructed from sturdy manufactured wood, this piece keeps your work space well supported. Keep it compact and organized with this desk, and still have enough room to store a computer, notebooks, and more.